Star Wars fans instantly recognize the man behind Lando Calrissian. In 1980, he made his first appearance in The Empire Strikes Back and then continued in his leading role in Return of the Jedi. Since then, Lando and Billy Dee have appeared in many subsequent Star Wars properties including video games, Star Wars: Rebels, and LEGO Star Wars. In December, Billy Dee will return to the Star Wars universe as Lando Calrissian in Star Wars Episode 9. His popularity in the fantasy Sci-Fi genre continued when he took the role of Gotham’s district attorney Harvey Dent in Tim Burton’s Batman, lending his charming good looks and suave attitude to the film. His Batman legacy continued finally when he got to voice the character of Two-Face in the LEGO: BATMAN movie! 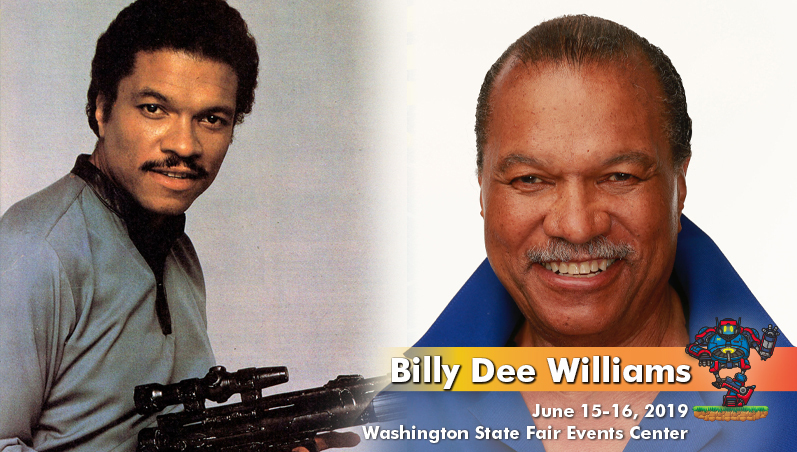 Aside from his film career, Billy Dee could also be seen on the television series Dynasty, 18 Wheels of Justice, Night Shift, Gideon’s Crossing, LOST and more recently has had a few unforgettable roles on series such as NCIS and White Collar. Billy Dee has appeared in numerous comedies as himself on The Jeffersons, Scrubs, Jimmy Kimmel Live, and Modern Family. He has also co-starred on Glee and the remake of Dirty Dancing. In 2014, Billy Dee was one of the celebrities chosen to participate on Dancing with the Stars, an experience he says was one of the best of his life. Billy Dee Williams has been nominated for many industry awards including The Emmy, The Independent Spirit Award, as well as winning the TV Land Award and the Image Award. Billy Dee is also an accomplished award-winning artist whose paintings are displayed around the globe. He has co-authored a few books including a love story called Twilight, with author Elizabeth Atkins Bowman, and the sci-fi thriller Psi Net, with author Rob MacGregor, and its sequels.